Florida is one of the top vacation destinations in the United States. As such, thousands of out-of-state drivers traverse Florida roads on a monthly basis. Many of those drivers are in rental cars. If you rent a car while on vacation in Florida, the attendant will ask you if you wish to purchase insurance. Your answer may save you from liability—or it may place liability squarely upon your shoulders. For this reason, you should consider the ramifications of rejecting rental car insurance before you decline. In most states, the involved parties—which may include the insurance companies, attorneys, and possible a judge and jury—will first try to determine fault before deciding who is liable for damages resulting from an accident. Who caused the accident? If the other party caused the accident, his or her insurance company may be on the hook for damages. However, if you caused the accident, liability would fall on your own insurance company, the rental car insurance company, or you. In the best-case scenario, fault would squarely fall on the other party. Unfortunately, accidents rarely fall into the “best case scenario” category. Also, unfortunately for you, Florida is a no-fault state. Because Florida is a no-fault state, each driver is liable for him or herself. This is the case even if the other driver caused the accident. This means that if you get into an accident in a rental car, your own insurance needs to cover the cost of damages. However, not all car insurance companies cover rental cars. 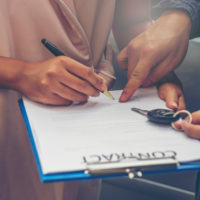 For this reason, when you rent a rental car—especially one you plan to drive in Florida—double check with your own insurance company regarding rental car coverage before declining the additional insurance. What Does Rental Car Insurance Include? If your car insurance company does not cover damage to rental cars, it would be wise to accept the coverage the rental agency representative offers you. Rental car insurance is often comprehensive and includes liability insurance, collision coverage, personal accident insurance, and more. Though this coverage may cost you a bit up front, it can save you exponentially if you do happen to be involved in a car accident in Florida. That said, even if your car insurance does cover rental car damage, double check with your carrier to make sure there are not any exclusions about which you should be aware. Some policies exclude long-term rentals or rentals for business use, a fact you do not want to find out about after the fact. What Should You Do if You Are Involved in a Rental Car Accident? If you were involved in a rental car accident in Florida, the first thing you should do beyond receiving medical care is contact a Miami car accident attorney. At Spencer Morgan Law, we can help you investigate the accident, navigate Florida law, assess your coverage, and explore your options for recovery. To learn more about what you can do to mitigate liability, contact our Miami personal injury law firm today.